No matter how cool iSpring tools are, they will get even cooler with time, as iSpring engineers regularly add new functionality to the current products. All upgrades are now available under the Maintenance Plan that took effect with the release of version 8 in October 2015. In this article, you’ll learn what this plan features and what tangible results it’s brought to iSpringers so far. Every new user of iSpring desktop software gets unlimited upgrades and support for free under a complimentary 1-year Maintenance Plan. This means that once a new software build is available, it can be immediately downloaded totally free of charge. 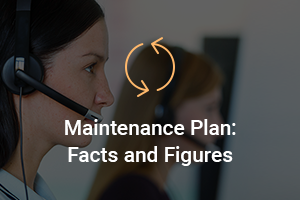 The Maintenance Plan also covers support from highly-skilled technical experts. Whenever you have a question, you can simply describe your case via phone or email, and iSpring professionals will provide you with a solution shortly after. Your Maintenance Plan is active for 1 year after the date of purchase. By renewing your plan earlier than 3 months prior to the expiration date, you’ll get a special discount. For example, if you’re using iSpring Suite, you can save $100, as the special price for the early renewal is $297 instead of $397. This special is also compatible with academic, non-profit and government discounts. As e-Learning keeps evolving and content developers have new ideas and projects, it’s essential to stay up to date with new educational technologies to implement them. iSpring engineers are constantly looking for ways to improve the current products and add new functionality. Since the release of version 8.0 last October, numerous updates have already been made. 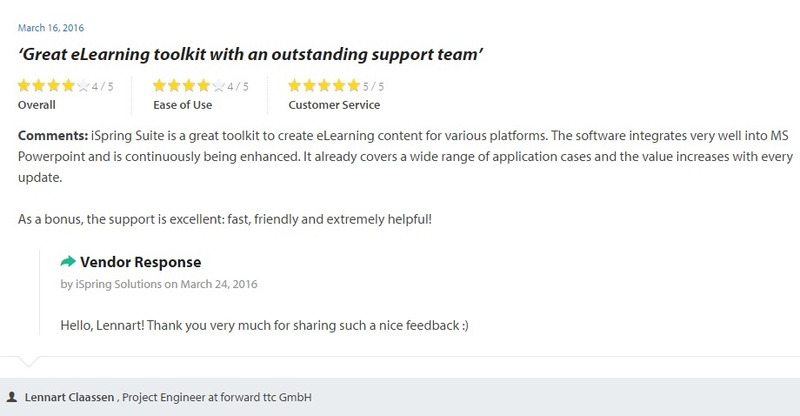 We introduce improvements after analyzing customer feedback and feature requests. Whether you leave a suggestion via email, phone, on the website or at a conference, we’ll take it into consideration. 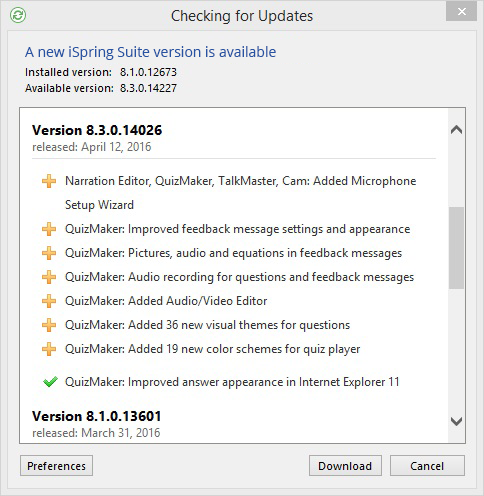 Here’s what iSpring users are saying about the updates in new versions. While many software development companies provide clients only with online communities, iSpring offers communication. Whenever you have a question regarding iSpring tools, you may simply call and talk to a competent specialist who will resolve your case within a short time. 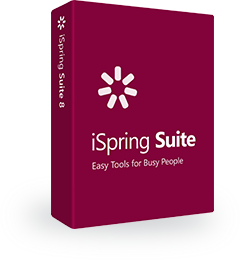 Indeed, who can know iSpring products better than iSpring support professionals? 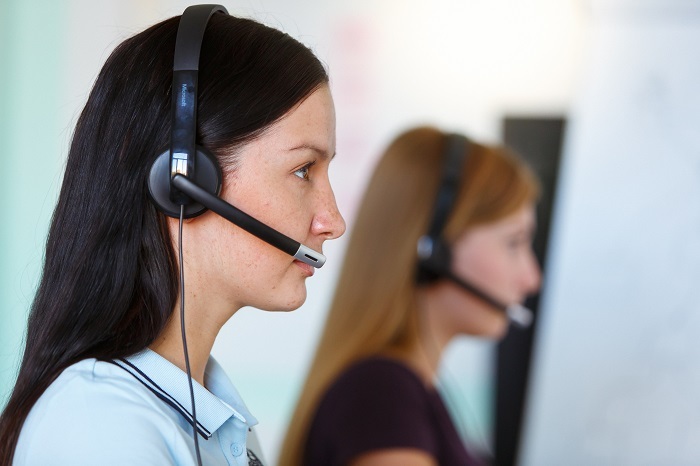 Specially trained technical experts answer all the received questions within 24 hours. Modern educational technologies evolve in leap and bounds, and so do iSpring products. To keep pace with these changes, take advantage of a Maintenance Plan that will provide you with upgrades and support for your iSpring product. Do you have any questions regarding the Maintenance Plan? Feel free to contact us at any time.